Families looking for New Mexico colleges should start with the NMKnowledge4college.org website which is a part of the New Mexico Department of Workforce Solutions. The website has an interactive Financial Aid Handbook that contains information on New Mexico state scholarships. It includes a description of various financial aid options, how to apply for aid, and a basic planning timeline. The website has a calendar listing area FAFSA workshops. Users can click on questions with video responses in English or Spanish. The community section lists various scholarships as well as links to videos. You can also ask questions through the website’s chat or by calling a toll-free number. The website links to the New Mexico Student Loans website which is a non-profit corporation that provides student loans. The Financial Aid Resources section has information on the FAFSA and the loan process. It also includes a planning time line. The planning for college section basically tells you to take the college tests and links to the ACT and SAT. There’s the usual timeline for juniors and seniors. The resources section has links to all New Mexico higher education institutions along with some various college planning related websites. The New Mexico Higher Education Department has information on state specific financial aid and scholarships. It also has a listing of general education courses that transfer among New Mexico post-secondary public institutions. The College Readiness section links to the NMknowledge4college.org website. There is a limited amount of credit transfer information under the Institutions section, curriculum option. 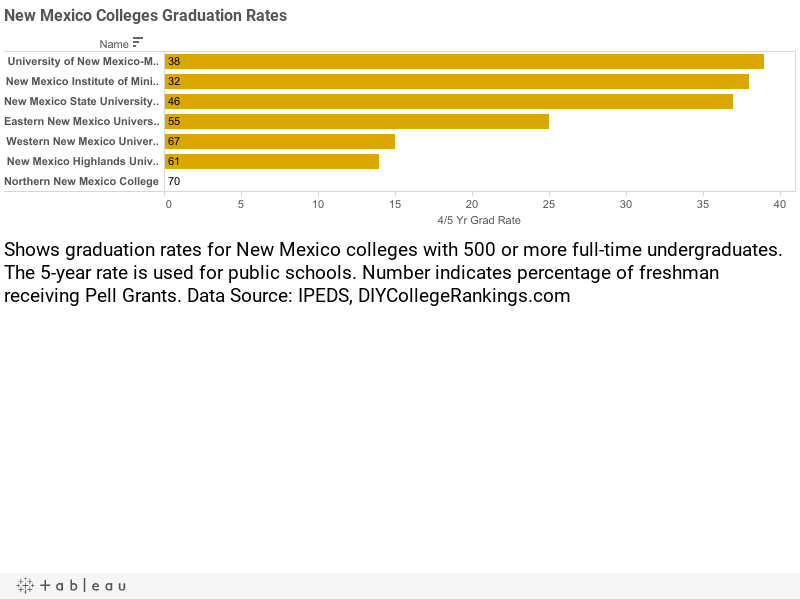 There are eight public four-year New Mexico colleges with 500 or more full-time undergraduates according to the Integrated Post-secondary Education Data System. There are no private institution with more than 500 full-time undergraduates in the state. The average five-year graduation rate is 24%. None of the New Mexico colleges meet the DIY College Rankings 50-50 profile requirements. College-bound seniors in New Mexico had an average of 19.9 ACT Composite score with a 18.9 for English and 19.7 for Math. The 75th Percentile scores were a Composite of 23, 23 for English, and 23 for Math. A total of three colleges reported ACT 75th% Composite scores were at or above this level.